Spectacular New Total Renovation! Custom Crafted by a Premier Developer! Grand Scale Duplex! Over 2100SF! This Beautiful Home boasts 3 Bedrooms and 2.5 Baths! Flawless Floor plan! Sweeping Open Livingroom and Dining area! Gleaming Custom Stained Hardwood Floors are Everywhere! 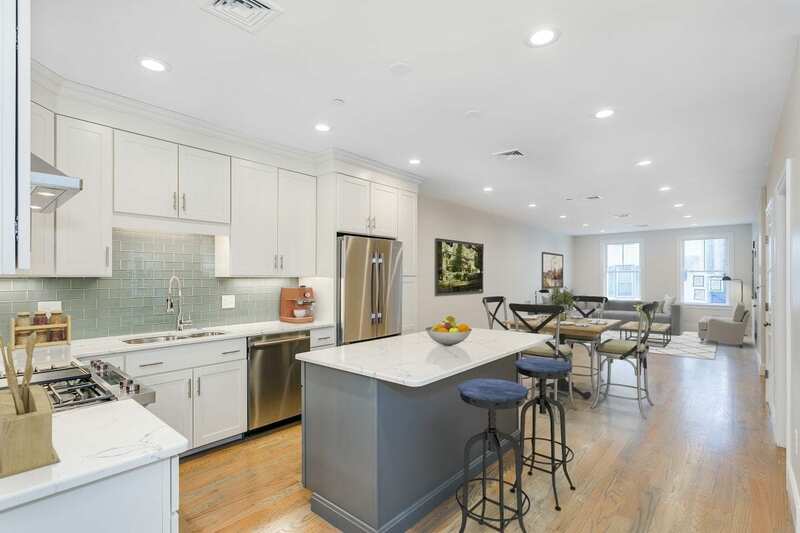 The Gourmet Kitchen offers State of the Art Jenn Air Stainless Steel Appliances & Sleek Quartz Counters with a giant Island & Abundant Custom Cabinetry! Dramatic Steel Gray Glass tile back splash! The Lavish Master Bedroom en suite with porcelain marble tile! Custom designed Closets! There are two additional generous Bedrooms and Full Bath! Enormous Familyroom with Wet Bar & Wine Fridge! The home also features a large Private fenced in courtyard! It is a perfect extension of your living space for grilling & entertaining! Every amenity you desire and more! Central air, in-unit laundry & impressive finishes! A Rare Offering!